The Weber Genesis three burner has been the quintessential gas barbecue since 1985. The Weber Genesis II E-310 GBS has GBS cooking grates which makes for a truly versatile cooking experience. 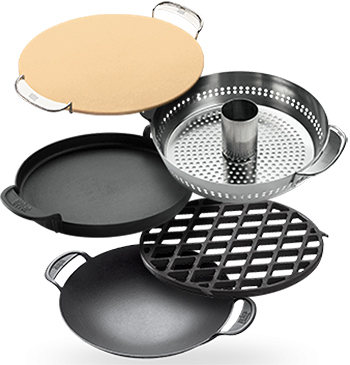 You simply remove the central section of the cooking grate and add in a Weber® Gourmet BBQ System accessory of your choosing; Pizza Stone, Griddle, Wok, and much more.